Normal mature RBCs are normocytic (MCV 80-100) and normochromic (1/3 central pallor). Its main function is to carry oxygen through its hemoglobin molecules. 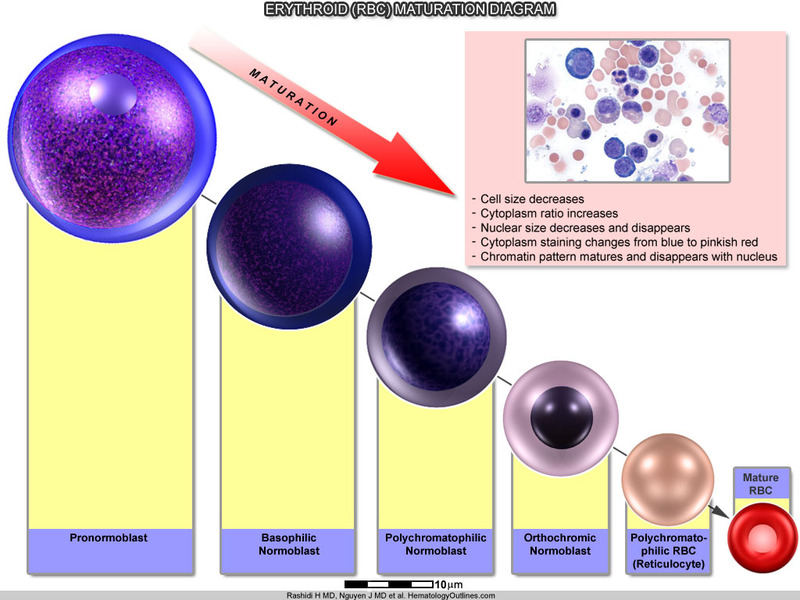 As erythroid precursors mature, the color of their cytoplasm changes from blue to gray to red-orange (this is due to the increase in the number of hemoglobin molecules within the red cells as they mature). Additionally, the nucleus of the red blood cell will become more dense as it matures, eventually excreting from the cell forming the mature RBC. 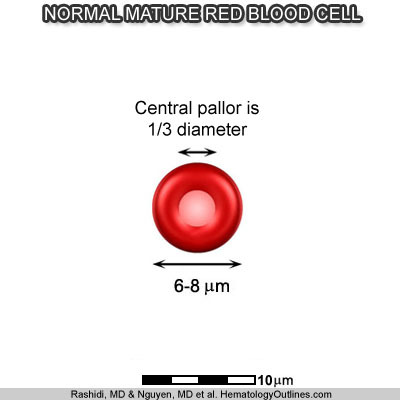 Normal red blood cells range in size from 6-8 um, and are slightly smaller than a mature lymphocyte. In addition, red blood cells lacks a nucleus. The cytoplasm is pink-orange in color with a central pallor that is 1/3 of its diameter. Increased production: The amount of red blood cells in circulation can increase in a variety of conditions, including: reactive erythroid hyperplasia, post-erythropoietin therapy, and polycythemia vera. These entities are discussed later in this online textbook. Note: For Decreased production of RBCs (AKA Anemias), see the Anemia image under the Textbook Table of Contents. 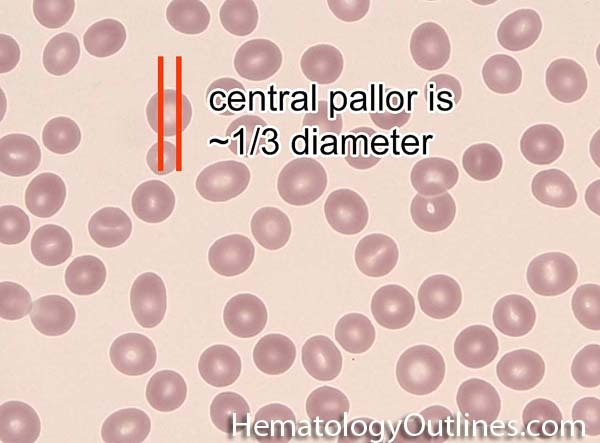 What is the size of a normal RBC? 6-8um, about the size of a mature lymphocyte nucleus.